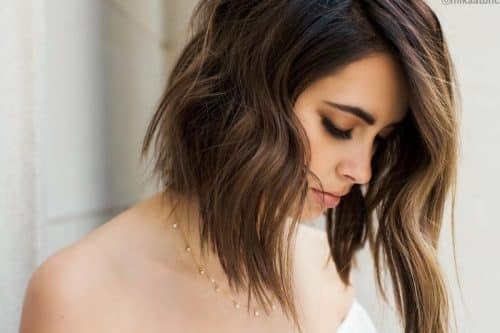 There are so many great ways to style shorter hair and here, we will arm you with an arsenal of some of the best updos for short hair for those special occasions. Grab your bobby pins, hot tools and hairspray and get ready for some amazingly fun new styles that you’ll definitely want to add to your “I need to try this!” list! Add dimension and body to your look by adding a little texture to your hairstyle, working with your naturally dark strands. Flaunt your golden brown hair and curls in an intriguing hair style that will be perfect for a formal event. 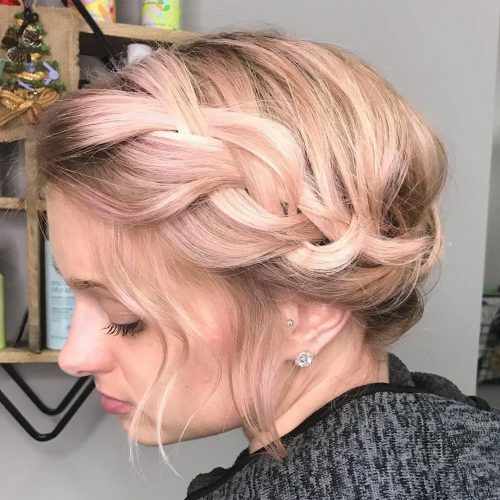 This charming pastel pink hair weaved through blonde highlights and brunette roots create an enchanting hairstyle that has various dimensions. Wow your guests on your special day with glistening blonde hair. Finish with a cute accessory for a flirty look! This look is actually one of my favorites. First of all, because when I did this style, I had never worked with such short hair before and it was quite a challenge for me. The best thing about this style is that it’s effortless and beautiful at the same time. It looks elegant and it’s really comfortable to wear. 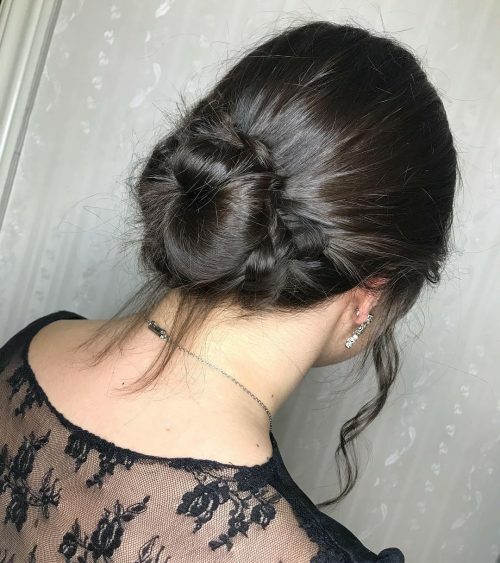 I would recommend this look to a client for the following reasons: it is suitable for any kind of event where you want to look classy and it can be done on any hair type or length. This style will go well with an elegant outfit and it will emphasize your feminine side. This textured swept-away look is very romantic. It gives you detail through the texture and keeps things soft and elegant throughout. This look is achievable with most hair types when using the right combination of products and technique with hot tools. Evaluating face shape, accessories, and style of dress will help determine whether this look is best for you! This look is whimsical and fun can work for a casual or formal occasion. This was so much fun to create because it just kind of went with the flow. If your hair is thin, this style may look different and will need more effort and possibly more product. The look consists of a combo of twists and braids that are pulled out a tad to create a fuller look or to fill any gaps. 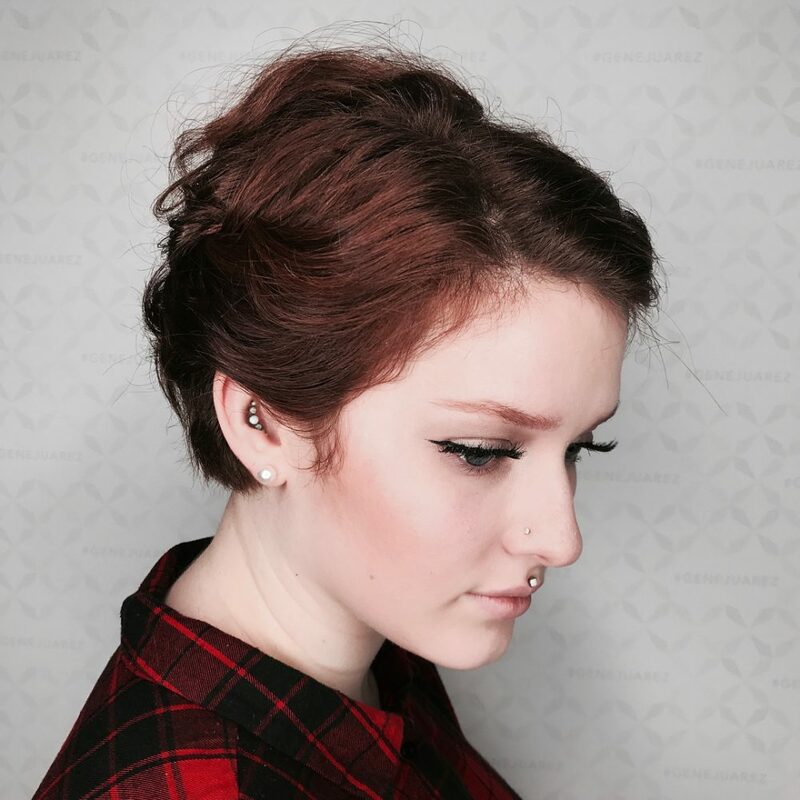 I used all Redken styling products to create this look and bobby pins. Go with the flow of the hair where it wants to go and have fun with it! With this look, I tried to create a style that was fun and romantic, yet polished enough to ensure it would hold up for a night of dancing! 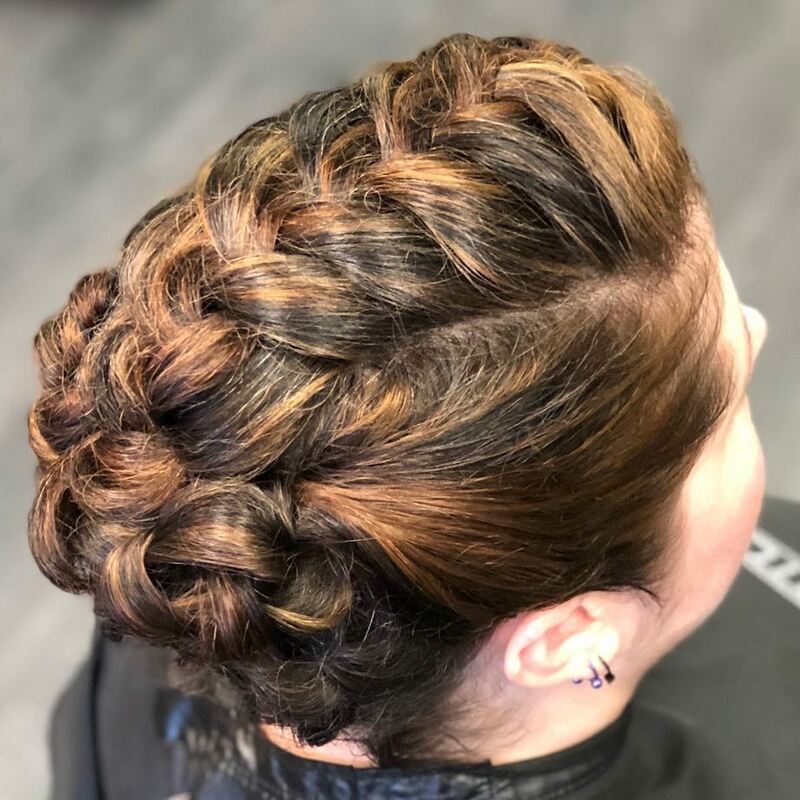 Having shorter/fine hair can be a challenge to create an updo with, but using braids that show off her dimensional color, while adding texture and hold to the hair, was the perfect solution! I’m a sucker for braids, so being able to really create the entire look with braids is one of my favorite things to do! I love how a braid can be beautiful in almost any look you’re going for. This is such a great look for almost any event! I always take the outfit and setting into consideration before choosing a hairstyle in order to best complement the overall image. 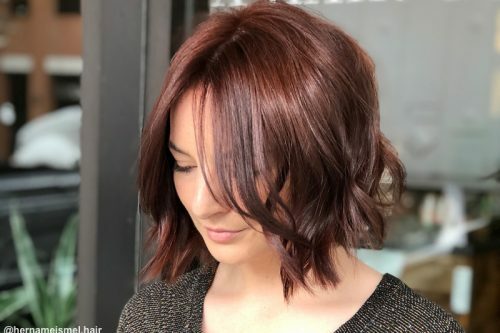 Hair length and texture make a huge difference, but if you have at least shoulder-length hair, I’d say you could achieve something close to this look. 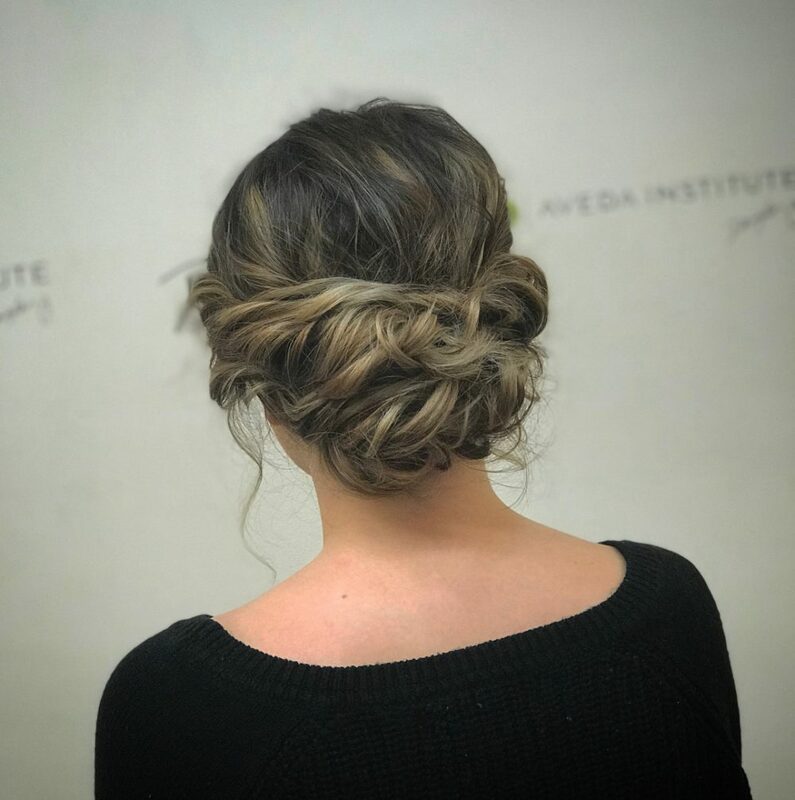 Products are amazing in helping achieve this updo. I love using dry shampoo and a light hold hairspray to create texture as I go. 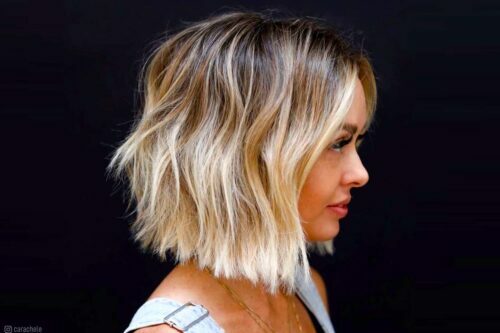 I’ve had multiple women with short hair sit down in my chair thinking their hair won’t ever be able to achieve a certain style, and my favorite part is showing them how a little goes a long way! My favorite thing about this look is that this model actually has super textured hair and is growing it back from shaving it completely for charity about eight months ago! We blow dried the hair out straight, straightened it with an iron, then braided it all! 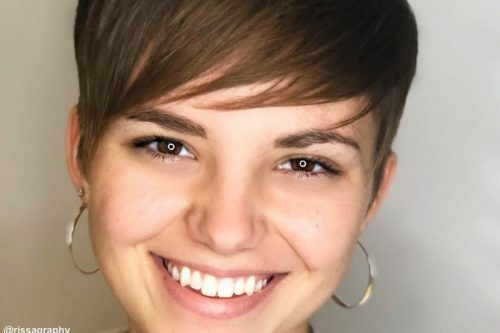 I think it’s a youthful and fun style that gives women with short hair a different option other than just wearing it out with product in. Preparation is key! Getting the braids to look neat would have been very difficult had I not smoothed her hair out first. I used a “dust” product to make her hair “dirty” so it had some grip (enough to hold the style in all day) because short hair braids tend to fall out if not in tight enough or if enough product isn’t used. I would describe this look as something that can be used as an everyday look or even a look you could use for a special occasion. I love how this style makes my client look like she has long hair but in reality, her hair is about shoulder length. Some advice for anyone that wants a style like this is to have a good hairspray and a smaller barrel curling iron. I used the Aveda Air Control hairspray for this look. If you’re the type of person you that likes the messy but elegant look, then this is the look for you! 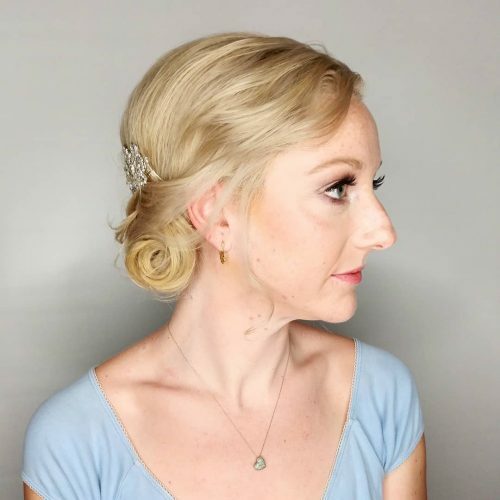 It is so much easier to achieve this style if you have a strong base of hair to secure your hair pins and your bobby pins into. 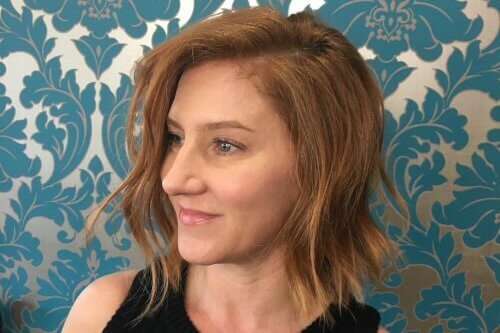 To make your client look like they have more hair, start the style further down on the head and make sure the ends of the short pieces are tucked in and secure. 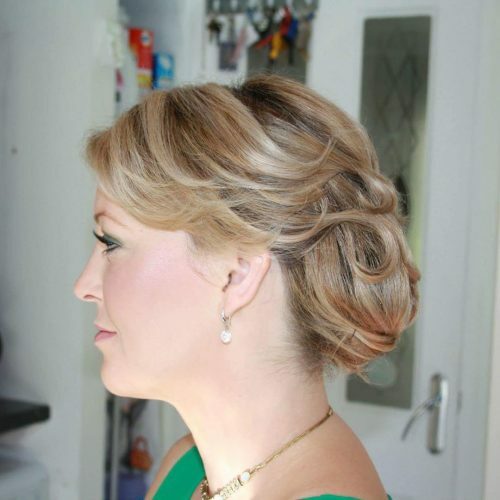 This is an easily styled updo that can be worn casually or even formally on a night out. 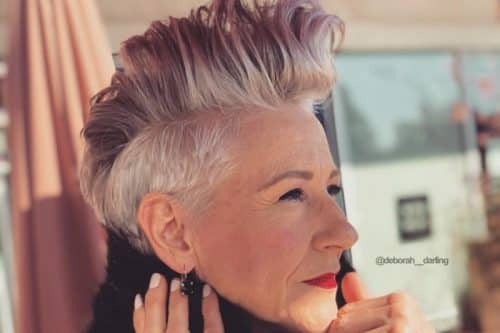 Most women with short pixie hair don’t believe anything can be done other than a nice blowout or some beach waves, but with a couple bobby pins and hairspray, it can be easily done. My favorite thing about this look is that it was done on a pixie haircut and it still looks put together. 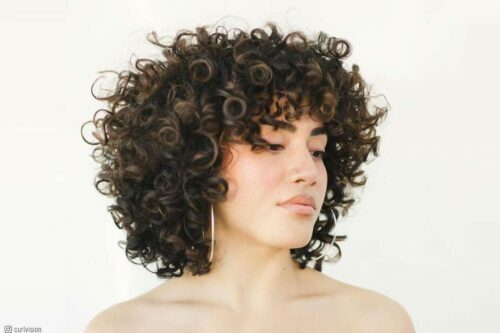 Some advice that I would give to a client is to keep the hair dirty (textured naturally, meaning curly hair or even with some dry texture spray). On this specific look, I used my client’s unwashed hair and put in some Oribe Swept Up to give it some grip. For anyone wanting to achieve this look, I recommend Oribe Swept Up or Dry Texture Spray. Another option can be Bumble and bumble’s Dry Spun Finish Spray. This look can give anyone the feeling that they took a good amount of time doing their hair, even though it really only takes a quick five to ten minutes. Whether you are late to work and you have bedhead, you can easily cover it up by adding curls/waves and some braids on both sides and bobby pinning them up. For people with this hair type, it is easy to achieve this look on a bedhead day. It’s fun, it’s different, and it’s stylish. I’d call this look a laced style. I love how the shortness of the hair didn’t affect the detail of the style. Due to the layering of the individual pieces over each other, it almost gives it a floral sort of twist to the style rather than an overly structured feel. 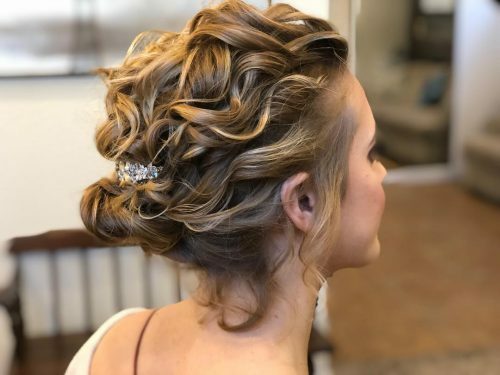 The client I did this upstyle on was going to a ball. She is used to tying her back due to work, doesn’t normally have any type of upstyles done, and was rather tall. We didn’t want to add more height we wanted the hair off the face to keep her comfortable. We used a sweeping side fringe to soften the look. We prepped the hair by blow drying and straightening it, so any hair type can wear this look with the right preparation. We also used a hair cream and hairspray to add separation and hold. I would describe this look as twisted chic. This look can be dressed up or dressed down and is best for shorter hair. The person in the picture had an above-the-shoulder cut and finer hair. 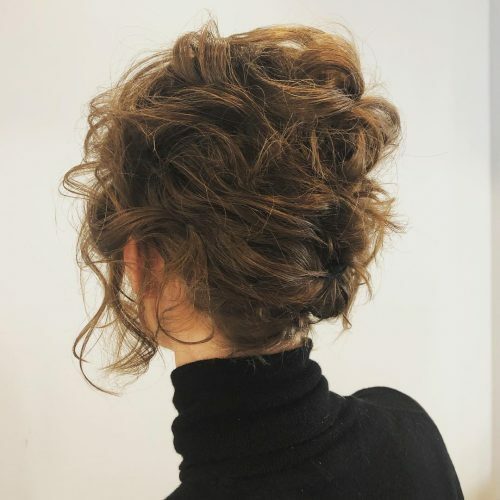 This is an updo on shorter hair. If someone with longer hair is considering this look, I would tell them that with their hair, the back would look fuller and would have more twist to it. This look is great for any occasion such as weddings, proms, a night out with the girls, and more. I would also say this look is great for all ages! This is a style that is going to last. If you need something to stay all day or all night, this is your go-to! Because of the twist in the back, it helps to secure the hair so you don’t have shorter pieces of hair falling. The products used on this client are all by Eufora. The main ingredient in this product line is aloe. 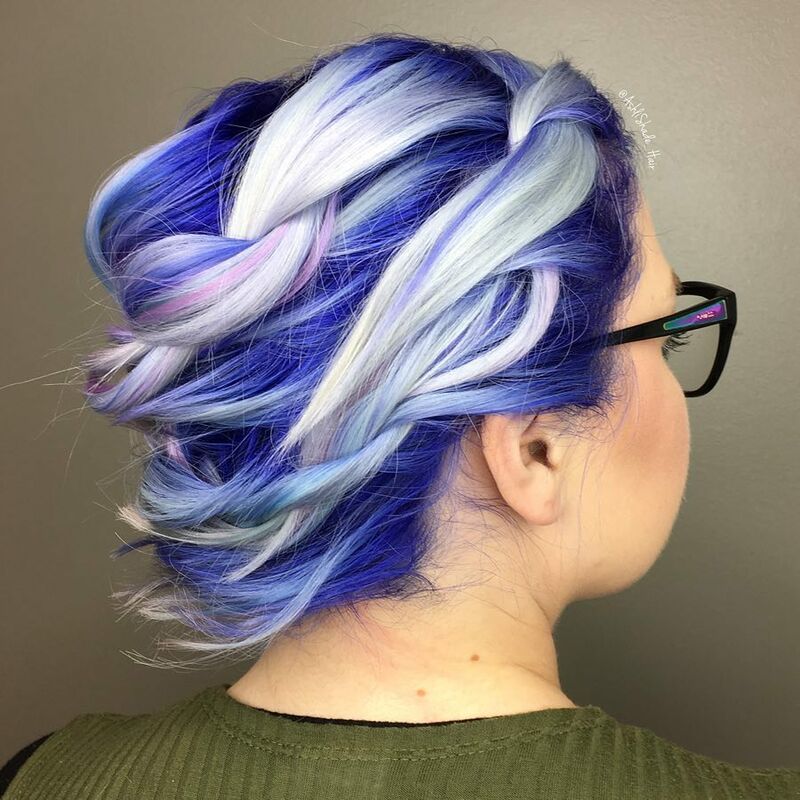 The hairspray I used while working with this updo is called Elevate. It is a workable, award-winning hairspray and one of the most environmentally safe hairsprays out there. 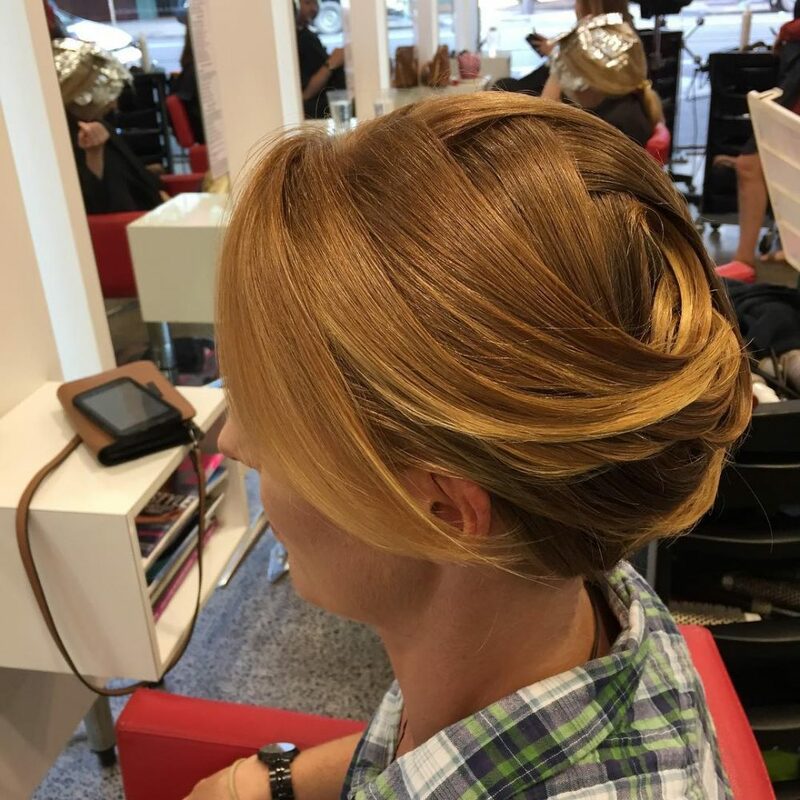 Who says you can’t have a fun updo if your hair is short? 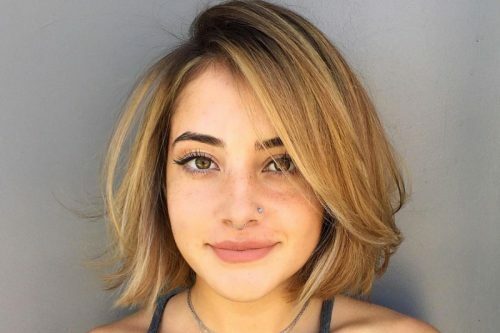 This style works great on shorter hair! 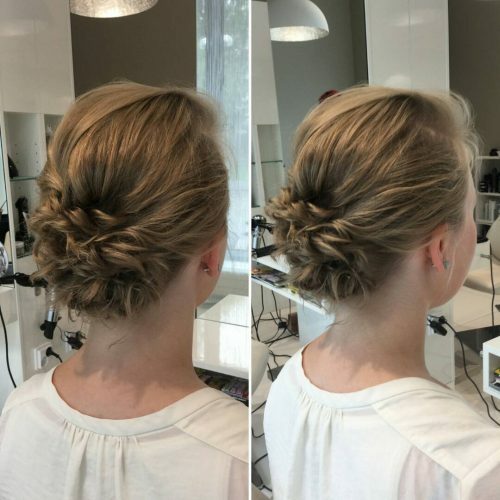 This an elegant updo that’s suitable for all sorts of occasions. My favorite thing about it is the braid. I love that it adds a fun and edgy side to the style without taking away from the elegance of it. Have your hair prepped with the proper products if your stylist isn’t going to do it for you. For example, smoothing products for thick/curly/coarse hair and volumizing products for fine hair. I recommend Paul Mitchell’s Awuphui Wild Ginger Mirror Smooth line for thicker hair and Paul Mitchell’s Lemon Sage volumizing line for finer hair. You’ll love the thickening spray! Prep the hair by cleansing and conditioning with a smoothing shampoo and conditioner. When working with thick hair, I recommend Paul Mitchell’s Awapuhi Wild Ginger Mirror Smooth line. Before blow drying, I applied a cocktail of Paul Mitchell Sculpting Foam with a squirt of Super Skinny Serum. When working with thick hair that’s curly, you will want the hair as smooth as possible to cut down on frizz. Part off a rectangular section at the top of the head, starting wide at the forehead and gradually narrower until stopping a couple of inches past the crown. I applied a texturizing powder and teased the section lightly. Now it’s prepped to do your French braid. Keep the braid loose and use a clear rubber band to secure. Pull apart the braid to make as thick as you’d like it. Roll the end of the braid and attach with bobby pins. Section off both front sides from ear to ear. Loosely pull the hair from both sections back and secure. Loosely braid the ends of those sections and twist and secure how you’d like. Part off 3 sections at the nape of the neck. I like to stagger the sections a little to hide the part lines. Braid each section and secure with a clear rubber band. Pull apart the braids to loosen and attach wherever they look good to your eye. Finish with a strong hair pray such as Paul Mitchell’s Stay Strong. I also use a shine spray as my finisher to tame any baby hairs and keep the frizz away! My favorite shine mist is Eufora’s Illuminate. If you do see some baby hairs popping up, spray them just a touch, then smooth and tuck them in with the end of a rattail comb. 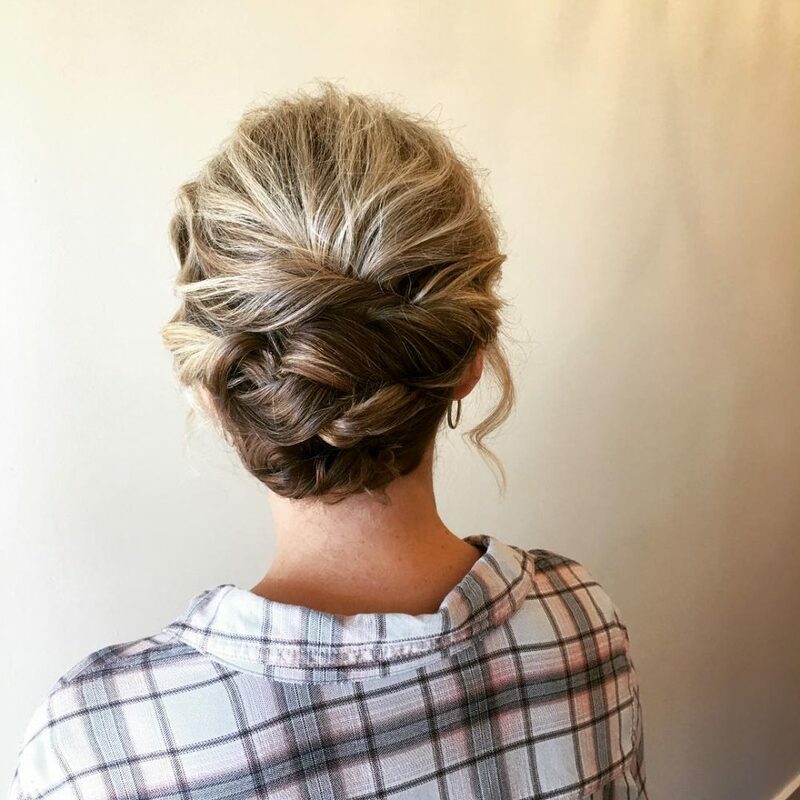 This updo is a great choice for you if you want a fun look that’s still elegant. It’s also secure enough to dance all night! It works well on all types of hair, but is best for thick hair with a bit of texture, only because you will achieve more fullness with the braid. This client in particular has A LOT of hair with nice texture! Not to worry though. If you have thinner hair your stylist can use texturing powder (Eufora carries a nice one called Powder Lift) and teasing to add fullness. 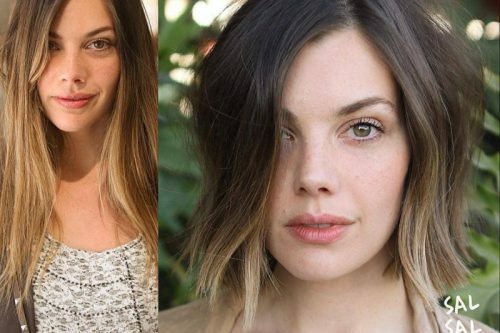 I would recommend this style for chin length to shoulder length hair. 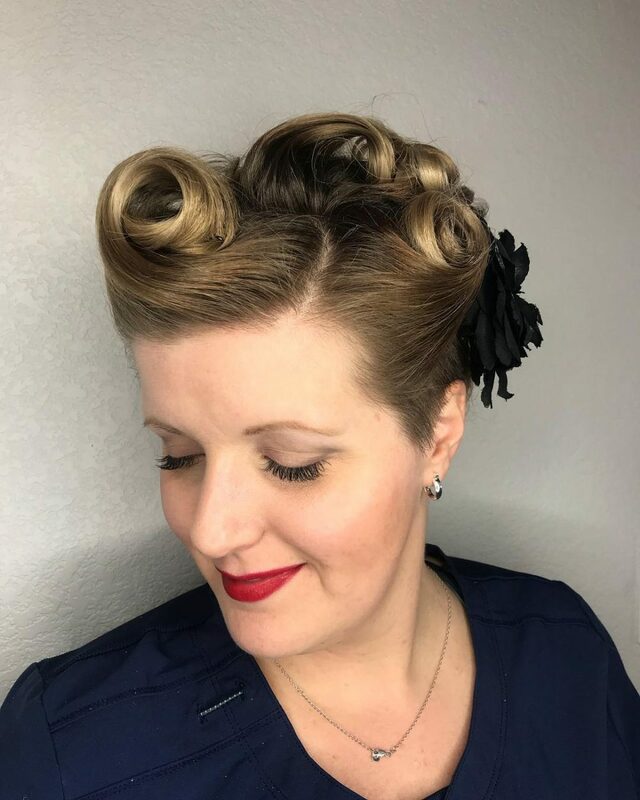 This is a 1940s-inspired victory roll style. This look was created to mimic the fighter plane maneuvers. Women wore it to support their husbands at war, as well as to keep hair out of their face when they first entered the work force. Victory rolls are commonly associated with the “pin-up” look. I love what this style represents and I love how something so classic still stays so relevant and looks great with both short. For short hair, you want to make sure to curl the hair with a smaller iron (3/4-inch) to get the needed hold to create the roll. For the back, you want to keep the small curls almost in tact without brushing them out to give it that pin curled look. I recommend using a nice oil serum to smooth out the hair before manipulating it into a roll. To finish, seal everything with a nice flexible hold hairspray. This look is fun for themed parties or the everyday inspired pin up-type girl. 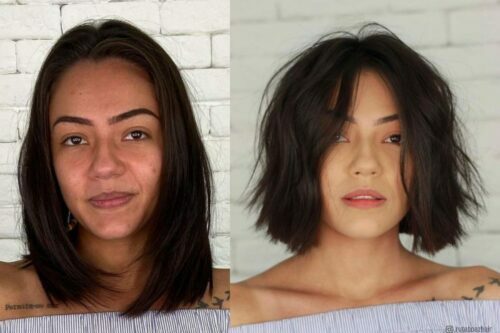 This look can be done on all lengths and face shapes, but this picture clearly shows that even women with pixie haircuts can achieve this gorgeous look! I would describe this look as a simple half up half down style with a small pop of boho flair. My favorite element of it is by far the braid. 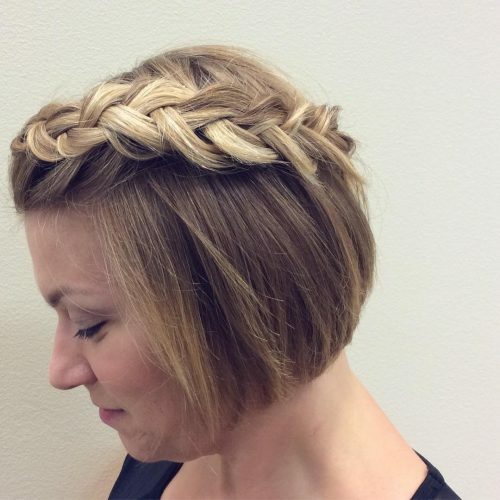 I love a good braid and think it adds such a fun and feminine feel. 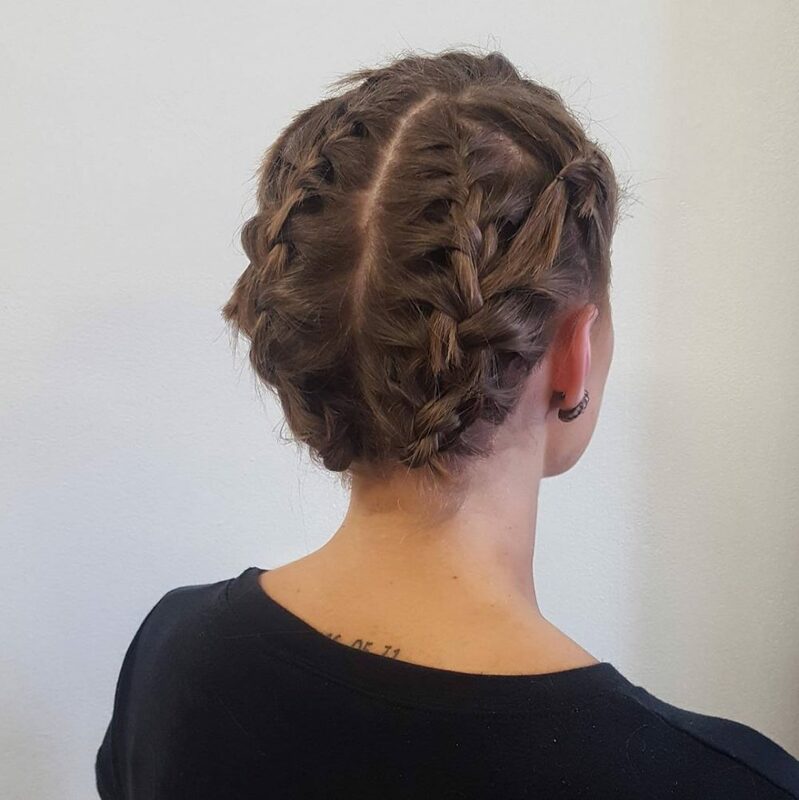 A good texturizing powder is a game changer for any braided style. In this look, we used Kristin Ess Working Texture Loose Styling Powder at the crown, followed by a small tease for volume. After the braid was created, I applied more texture powder directly to the braid and pulled it apart to get a thicker and fuller appearance. This product helps keep the volume at the crown and within the braid for an all day hold. 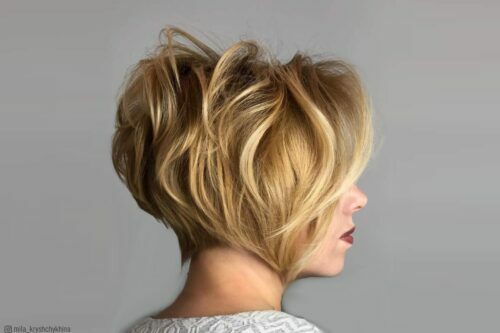 This look is perfect for any client with short, fine hair that is looking for something simple with a little twist. An added bonus in creating this style is that it takes almost no time to do! Anyone that’s limited on time but wants to add a little pop of fun to a simple style is the perfect candidate to try this look. I would describe this braided look as having texture, being versatile, and great for anyone who needs their hair off their face. Not to mention, it’s super fun and sassy! 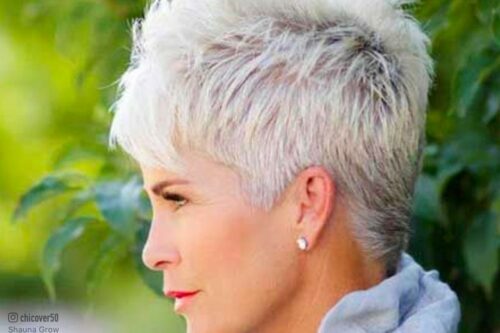 When it comes to recreating this look, your hair is definitely going to need some “grip”. If you are styling your second-day hair, I would recommend using a dry shampoo at the scalp and maybe a texturizing spray on the rest of the hair before you begin braiding. This refreshes the hair and allows it to stay in the braid that much better. If you’re starting with freshly shampooed hair, a mousse or volumizing spray will work great as you blow/air dry. Then, using a texturizing spray or even a light hold hairspray on dry hair will help those with finer, more soft hair to get the braid to stay well. Avoiding any sort of smoothing product will be in your best interest until you are completely done with the style. You can maybe use it at the very end as needed to tame flyaways. I loved Aveda’s Shampure dry shampoo, Texture Tonic, and Air Control hairspray for this look! Also, note that the braid is an inside out braid, or a Dutch braid. Each strand is brought under one another instead of over. The tighter you braid in the beginning, the more likely it will stay. Once you’ve finished the braid and have it pinned, you can gently pull the hair to give it a bigger, more textured style. Have extra bobby pins handy in case you need to pin little pieces that stick out back into the braid. 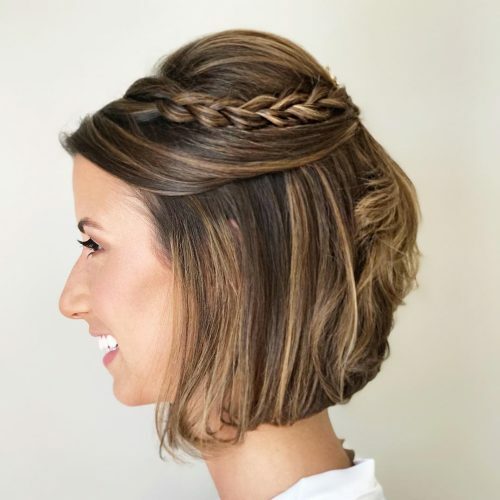 This braided look is great because it works well for just about any hair type and texture (fine to coarse, straight to curly, and everything in between). If you have finer hair, you may need to implement more product to give the hair that “grip” and maybe pull it apart a bit more in the end, but it most certainly can be done. The only tricky part is if someone has shorter layers or a fringe that doesn’t stay within the braid. This is a look that can offer some volume in front and elongate the face, and still leave room for volume in the back as well. The style is also versatile. It is something that can be worn casually with jeans and a tee, or be fancy and worn with a cocktail dress and flashy jewelry. 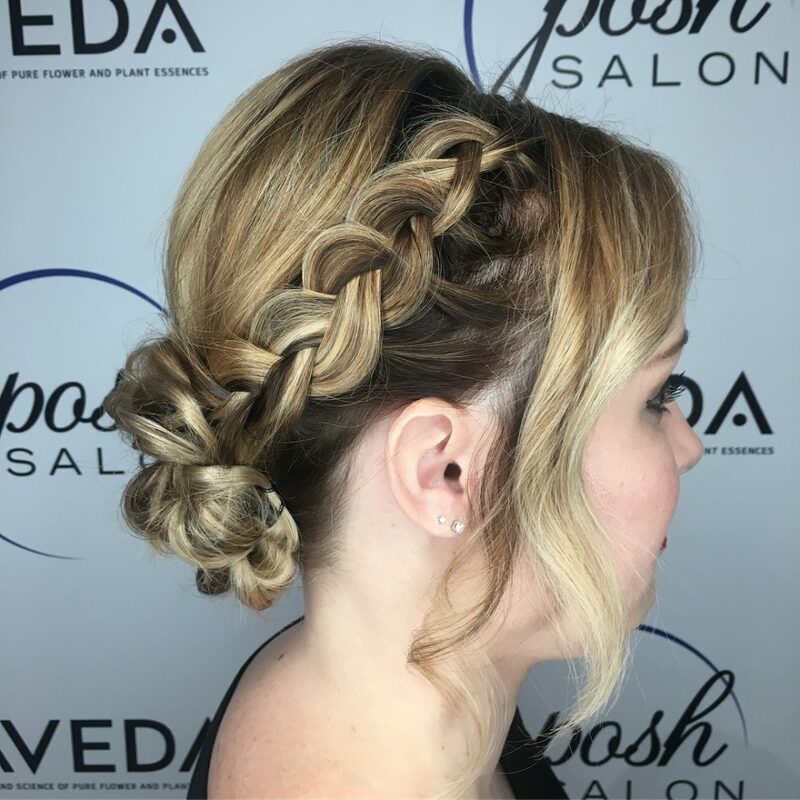 Sometimes it’s hard coming up with a sophisticated updo that works with a longer pixie cut or a bob, but with the look of this braid, us short-haired girls don’t have to be left behind! When I first met my client she had been deflated by a previous stylist offering no enthusiasm or possibilities for her length of hair. 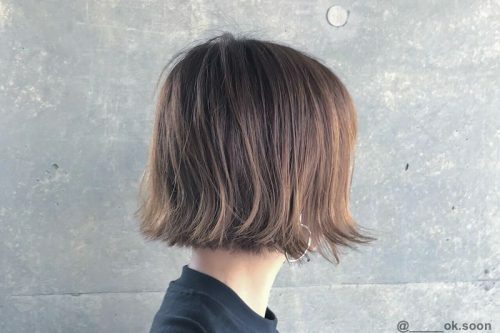 Her hair was very short, but there is always something that can be done. For her wedding day, it had to feel special! We looked at ideas that she preferred most and although she knew she couldn’t achieve it , I took parts of each style she liked to tailor one for her hair. My client loved the plaited style made into roses. She loved movement and how it swirled, so I used that for how I finished the ends. I would describe the look as an elegant side bun with movement. I love how simple it is, yet not boring at all. I used very minimal products for her hair. 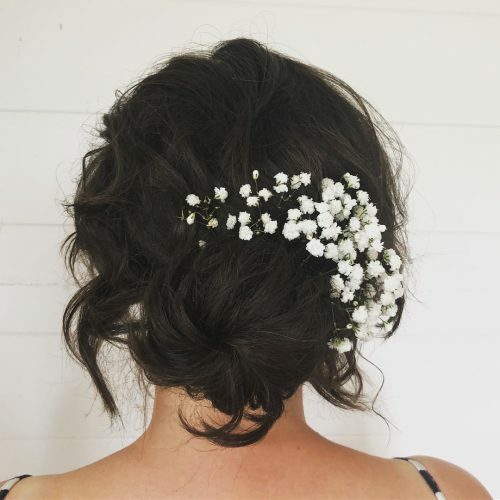 She had quite tricky hair as it was quite coarse and frizzy, so a soothing balm worked into my hands while placing and styling gave it just enough to stop it from going out of control. To create the curled ends I used the smallest size ghds. Using the ghds as opposed to tongs smoothed the hair out before flicking the ends up. To finish it, I used plenty of hairspray. My favorite is Bed Head Masterpiece with a light finish in Hard Head. I would recommend this style for clients wanting to make the most of short layers at the sides rather that glueing them down with hairspray. The back of the hair could be for any length, but I do actually prefer it for shorter hair. I think this look would suit any client who likes their hair out of their face, but doesn’t want a harsh scraped back style. This look is an easy low messy bun that was created by twisting the hair. My favorite thing about it is how feathery and light it looks. This is due to the hair type of my client and the looseness of the updo. The color is my client’s own natural color (a typical Finnish blonde) which brings nice dimension to the style. First of all, I recommend that the hair is not too long or short. My client’s hair was shoulder length. That is well enough, if only it’s not too layered. Huge amounts of super thick and sleek hair is even kind of tricky to work with. Volume products are the key to styling fine hair. The products I used included sugar spray, dry shampoo, hair powder, a light hairspray and shine spray. When styling shorter hair, I think it’s important to put in some good base products for volume and texture so that you really get the hang of the material you’re working with. Let the hair itself be your inspiration and just go with the flow! This look was made for a guest going to a lovely summer wedding. Looser buns are perfect for so many occasions and styles since it can be personalized in many ways. My client’s hair was very thin, but she has lots of it. This type of hair works nicely for a messy bun. It keeps the look careless and airy. Any falling loose strands only give a finishing touch to it.